According to the report released in mid-January by the California League of Food Producers, total inventories of US processed tomato products amounted to approximately 12.1 million short tons (sT) (11.004 million metric tonnes (mT)), stated on a raw product equivalent basis, as of 1 December 2018. Inventory is down 1.7% from the prior year level. Apparent disappearance of tomato stocks has increased 3.6%, totaling approximately 6.6 million sT (5.95 million mT) during the six-month period of 1 June 2018 to 1 December 2018, as compared to the prior reporting period (June-December 2017). Over twelve months, apparent disappearance in the US amounted to 13.03 million sT (or 11.82 million mT), which is 8% more than during the previous period (December 2016-December 2017, with 12.07 million sT or 10.95 million mT). The monthly disappearance rate is therefore once again drawing close to the symbolic bar of one million metric tonnes, with the disappearance of a raw product equivalent volume of 985 000 mT (or 1.086 million sT). This theoretical monthly threshold of one million short tons was reached exactly ten years ago in December 2008, and disappearance had not dropped below that level since then, even at the lowest point of apparent disappearance in the US in December 2017. In a detailed breakdown, the 8% recovery of apparent US disappearance seems mostly based on an increase in operations in the national paste remanufacturing sector, whose stocks have dropped by about 10% compared to December 2017, and on a notable increase (+22% compared to December 2017) in the sale of products of categories other than paste. It would indeed seem that the distribution of pastes intended for sale, particularly for the export market, was slightly less dynamic during 2018 (January to December) than it was in 2017. This result will need to be confirmed or adjusted in the coming months when the official results for US trade in 2018 are made available. Apparent disappearance over the past twelve months absorbed 13.03 million sT (or 11.82 million mT) on a raw product equivalent basis. Pastes intended uniquely for sale accounted for 60% of this total, while pastes remanufactured internally accounted for about 14%, and other products for 26% of the total. According to the figures released by the CLFP, total bulk tomato paste stocks, including inventory held for remanufacture, were estimated to total approximately 8.5 million sT (7.78 million mT), on a raw product “paid-for tons” equivalent basis, as of 1 December 2018. Despite a notable increase in the quantities dedicated to this processing sector during the past season (+15%), available volumes still stored in the warehouses of US operators are more than 5% lower than those recorded in December 2017. The US bulk tomato paste-for-sale inventory on 1 December 2018 was approximately 5.7 million sT (5.18 million mT), on a raw product “paid-for tons” equivalent basis. CLFP statistics reports are estimates, assuming 100% reporting, of the total US processed tomato supply, based on voluntary reports from processors throughout the United States. Participating processors handle approximately 90.0% of the total US tonnage of processing tomatoes, and 95.8% of total US paste production. The situation on 1 December 2018 alters the prospects of the US processing industry. In this new context, current dynamics have the rate of apparent disappearance following an annual trajectory of close on 13 million sT (11.8 million mT), which is slightly higher than the one that was determined last July (12.9 million sT). While preparations for the next season are still ongoing, US operators, particularly in California, will certainly be bearing this figure in mind as they decide on processing targets for 2019. They will most likely also remain vigilant regarding the domestic and foreign components of apparent disappearance, as well as regarding the expected shifts in the exchange rate between the US dollar and the euro, which feature among the main parameters of the competitiveness of US products on foreign markets (see infographics at the end of this article). 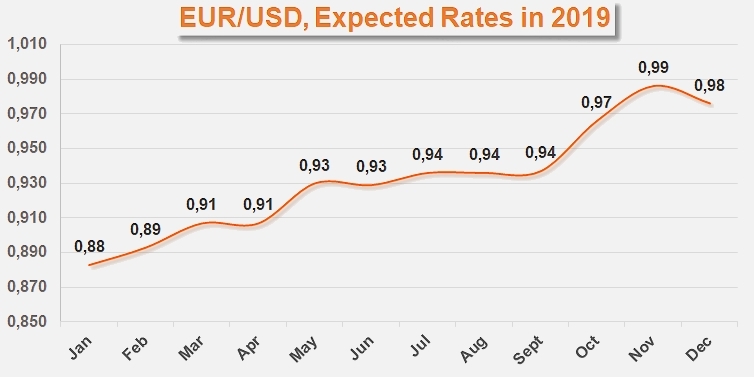 Expected evolution of the EUR/USD exchange rate over 2019: according to the "Agence de Prévisions Économiques" (Economic Forecasts Agency), the USD could undergo a notable consolidation in coming months, a situation that is generally considered favorable to European exports. There are, however, many other conflicting projections on this subject, and we will remain vigilant in order to inform our readers of any decisive developments in the sector.